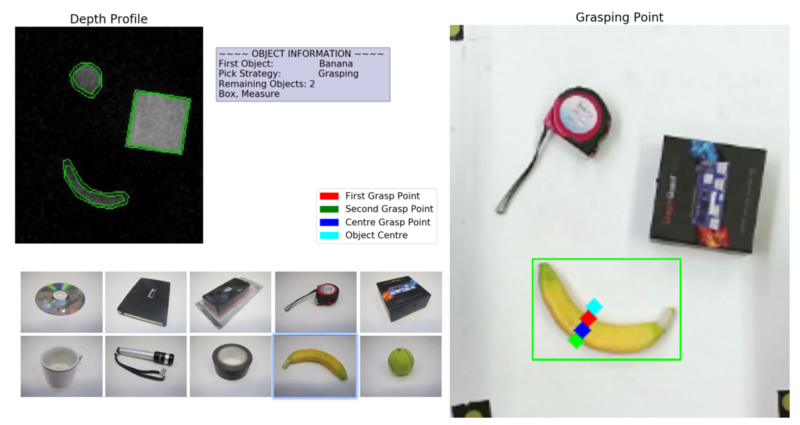 The goal of the project is to develop a robotics pick and place system which allows objects to be identified using vision systems, picked and then placed on a shelf and then the reverse operation performed. 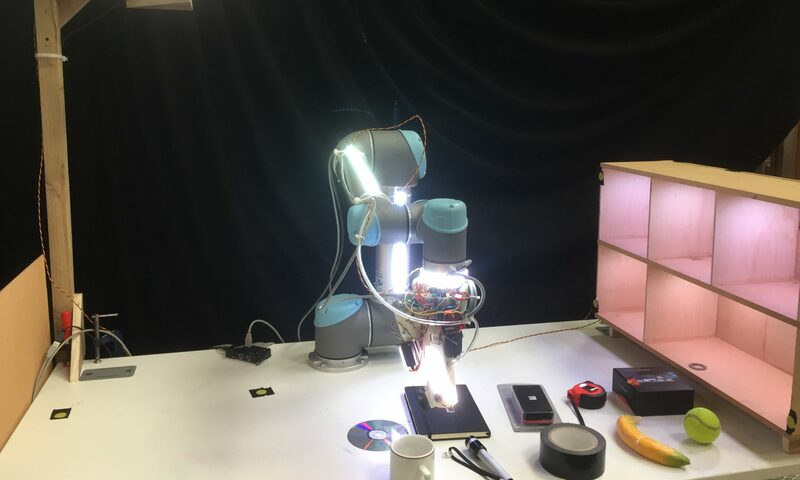 The overall aim of the project is to compete in the Amazon Robotics Challenge. 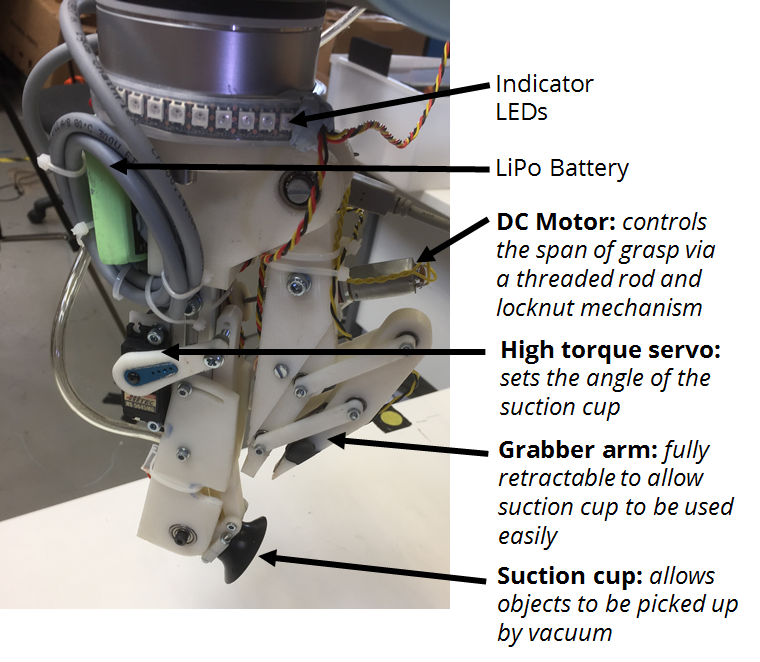 Initially the goal is to work with a set of 10 diverse objects and develop an autonomous system to perform this operation on these 10 objects reliably. We are team from the Bio-Inspired Robotics Lab, at the University of Cambridge working on developing a robotic manipulation platform. Many thanks to the Arm University Program, Cambridge, UK, for their support of the project. 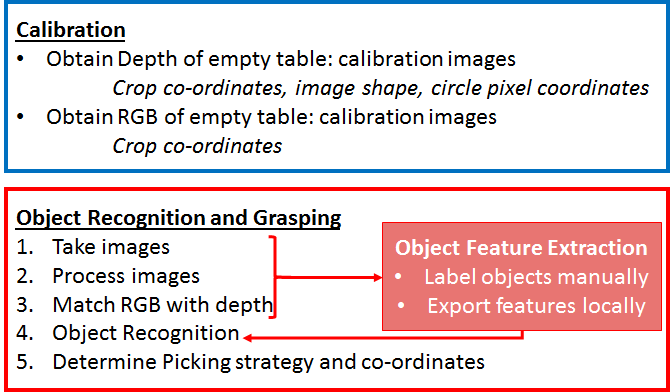 Below are videos of the different objects being grasped from the table, identified and placed in the shelf and then grasped from the shelf and returned to the table top. 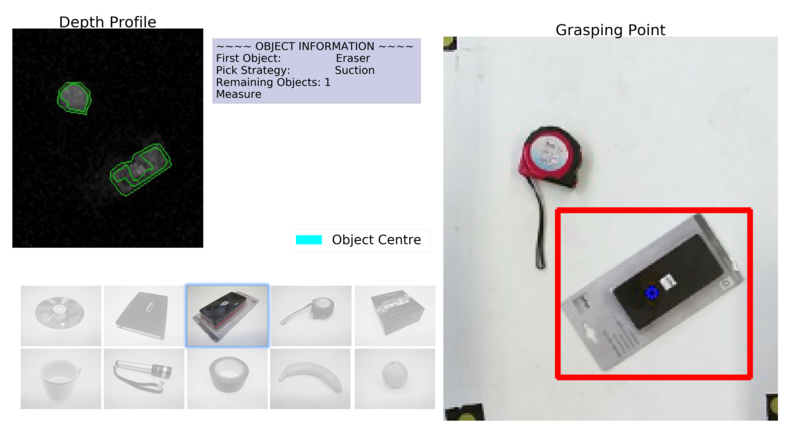 The specific grabbing strategies developed for some objects is now demonstrated. a. The suction cup is lowered in the middle of the object, b. until it is detected that the object is in contact with the suction cup, c. the object is placed on the shelf, d. suction is used in the centre of the object to pick from the shelf. a. 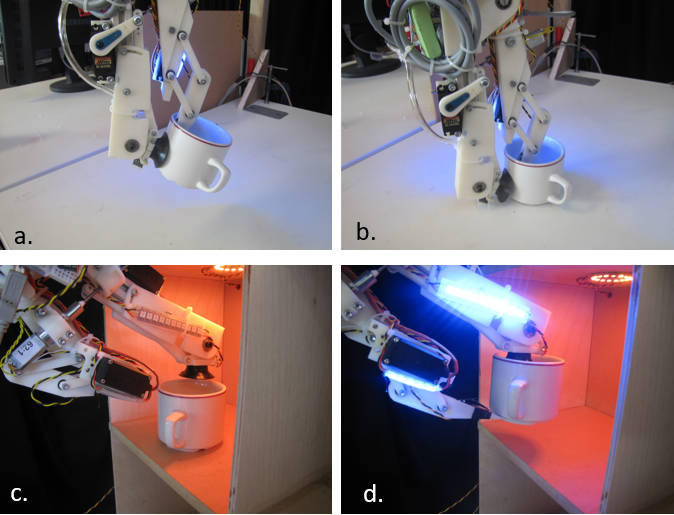 The cup is grasped between the suction cup and the grasping arm, b. lifted, c. placed on the shelf, d. the cup is then dragged to the front of the shelf and the manipulator arm moved underneath to cradle the mug. a. 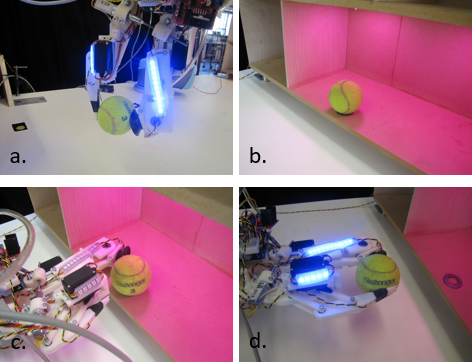 The ball is grasped and lifted, b. placed on shelf without rolling, c. grabber is aligned with ball, d. lifted. The manipulator is controlled using an Arduino, connected to valves and motors which communicates with the main PC over serial. A block diagram of the system is shown below. 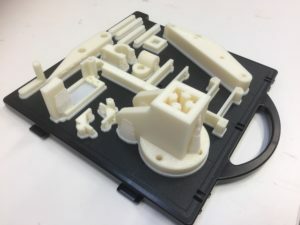 Much of the system has been produced using rapid prototyping methods allowing rapid testing and development. The CAD files are provided in the resources section. 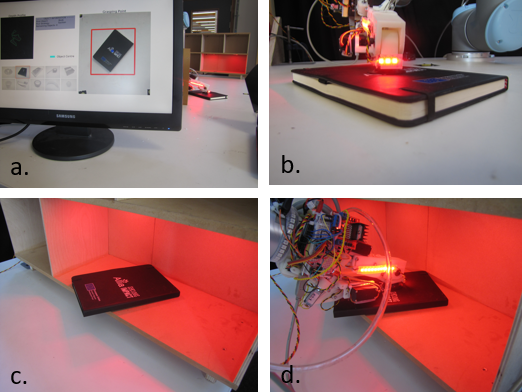 Using this method, we were able to develop and test a number of different manipulator solutions rapidly. The code developed can be found at our GitHub account here. The CAD files which have been developed for the end manipulator can be found here.